I see on the TN Morel site that some are claiming to have found some morels already. I have been on that site for a couple years now and typically post under the Ohio and Indiana forum. I am not saying those that have found some are lying but I do know from that message board that many just love to be the FIRST one of the year to claim they have found morels. Those that usually truly find morels early will lay them out on their daily newspaper to date authenticate their early find. If they are truly finding them already this would be amazing. I noticed on the morels.com site that they have a soil temp map. Per their map my area of southern Middle TN is in the 45-50 degree range now. West of me over around Memphis TN, they are in the 50-55 range already. That guy that is posting that he found some already may be over in the Memphis area. That's a pretty cool map. Looks like my advise on no morels of any quantity until 4/1/12 in your area is going to be way off this year. If they are already finding morels on Feb 26th then you should be rocking by mid March which is really early assuming the weather we are having continues. I still would like to see those fellas take pictures with the mushrooms laid out on the front page of their local paper to authenticate the date. I have the first week off of April from school for spring break and I will headed to southern Ohio to see if if I can get lucky in finding some morels. Still a bit early for Ohio but they are about 4 to 7 days ahead of us in southern Ohio verses central Ohio. If this weather holds out who knows what this year has in store on morels quantity wise and fruiting time frame wise. 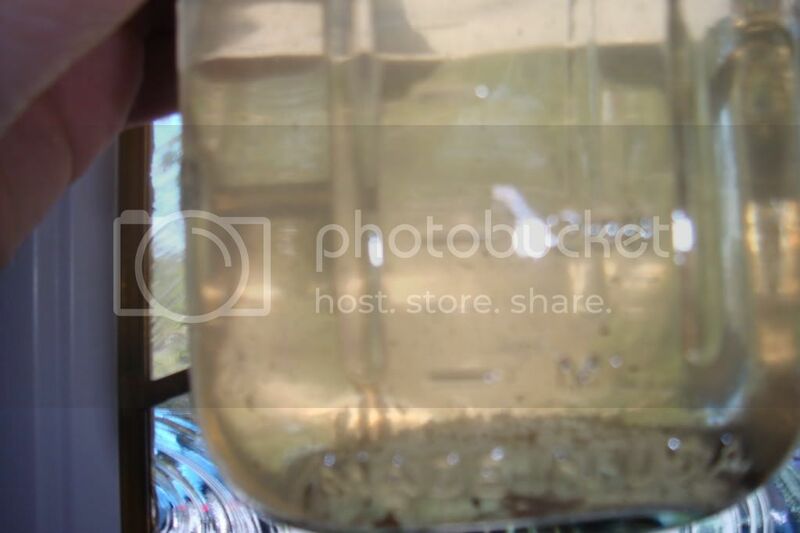 Is that morel debris floating in the glass jars or the beginning of sclerotia forming? That's a good idea too on putting a bit of honey in the water to feed the sclerotia. Hey I just checked out the TN morel message board and this is what was posted below and this makes sense to me. So this member has his doubts too. Here is his post below. \"I?m not sure who Shooter is trying to kid but you?re not going to find in morels in TN until the middle of march. Without some sort of picture evidence I?m just not buying it. The first week of April is normally the peak of the season for most TN, you?ll have both blacks and yellows up at the same time. Look for Ash trees, the bigger the better. Latt those are pieces of morels from a cleaning the honey works really well gives some added nutrients gets some myc threads running off of those pieces. The honey helps with souring also. TN just keep an eye on that message board Morels.com, just changed over to a new format due to spamming(Go Figure). Lost alot of data due to the change over, but that site will just take off here in the next few weeks. Like Latt said you have to watch those early posts, you don't want to hit the woods hard when a guy posts a pic of a tiny black picked off a sun baked ridge. When you see many posts in and around your area get out alookin. Wish you the best of Luck. trahn007, drop me an email with your correct email address. I have something to ask you. Thanks! TN.... I hate to ask but what part of TN are you from (I wish this site had PM) I've hunted up and down TN and willing to give you some GPS cords on some good area's for morels. My little guy was born on April 19 last year and really cut down on my travel, willing to hook you up with some of those spots if you live close. I am in southern Middle TN. That is as close of a description as I can give on this board considering I am growing wild simulated on my property. I do have a email address on my wildgrown profile if you want to email me. I don't check that email address much, mostly have it setup to catch all the auto reply/messages from this forum and emails from my youtube channel. Got to play it safe when you are growing seng on your property and posting on a web message board. I will sure take any morel tips you can give.